Are you paying for electricity that you are not using? Reduce your Peak kVA Demand Tariff and Save Money. The Electricity Utilities and Retailers are changing the way they bill you. 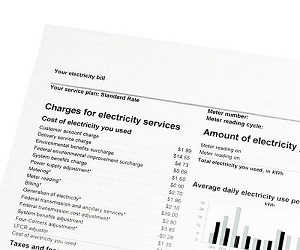 Electricity retailers are in the process of changing how they are billing you. The changes are currently being rolled out across Australia. Traditionally, our electricity has been charged according to a kW (kilowatt) demand tariff which is commonly known as ‘real power’. This means that you are charged for the electricity that you actually use. The change is that you will now be charged according to a kVA (kilovolt-ampere) demand tariff which is commonly known as ‘apparent power’ (or real power plus re-active power). Every electrical facility consumes an amount of re-active power. This energy is considered ‘wasted’ as it does not perform useful work. So if your billing has changed to a kVA demand tariff and you have a poor Power Factor, you are definitely paying for that wasted power. Power Factor (PF) is simply the ratio of the power that you are using vs the wasted power. A PF of 0.7 means that 70% of power is being used effectively and 30% is being wasted. The billing changes will result in you paying for the wasted power in your system. Simply by reducing the amount of wasted power. By installing Power Factor Correction equipment, you can achieve significant savings – immediately! Typically, most installations achieve savings of 10%-30% and some sites qualify for rebates, depending on location. Absolutely! It makes great financial sense. Typically, our customers achieve a ROI (Return on Investment) of 6 months – 2 years. After this period, they benefit from on-going cheaper electricity costs permanently. How do I know if I'm paying for wasted power? That’s easy, the team at Fuseco can help you understand how much you are paying for electricity that you are not using. We offer totally independent advice as we have no affiliations with any power utilities, distributors or retailers. We have your interests in mind and will only recommend high quality solutions with measurable results. We help you save money by providing you with equipment (a once-off investment) that will permanently reduce your Power Factor and therefore your electricity costs. How can Fuseco help you? We welcome you to contact us and tell us about your site. We will happily assess your bill and determine whether you need Power Factor Correction. If you do, we will offer a tailored solution and show you how much you will save. We will also clearly explain your Return On Investement (ROI) so you can make an informed decision. There’s no charge - no obligation. We recommend the Sinexcel SVG units, which represent the latest generation of PFC technology. The older technology uses banks of switched capacitors to improve your Power Factor. However, capacitors typically fail within 3-7 years. To ensure that these units keep performing optimally, you need regular inspections, parts replacement and ultimately high maintenance costs. The SVG is a totally modern electronic solution which does not use switched capacitors, provides the highest possible performance and requires very low maintenance. Read the following before you order a PFC solution. The new Static Var technology used in our SVG systems marks a breakthrough in Power Factor Correction equipment. It eliminates the need for a capacitor bank, significantly reducing on-going maintenance costs. It will permanently operate at its optimum level so you will benefit from on-going energy savings year after year. Our SVG units are easy to install, set up and operate with virtually no need for maintenance. You can even view the real time performance data on the LCD screen – total transparency! It’s our objective for you to have total control over your PFC needs. We will tell you what you can expect to achieve, provide you with high quality solutions and demonstrate measurable results. Honest advice, quality equipment and long term electricity cost savings! Don’t fall into the common trap of being sold poor PFC equipment! This just may be the best advice we can give you. PFC equipment have traditionally used switched capacitor banks to reduce Power Factor. Capacitors typically fail within 3-7 years of installation. In a traditional capacitor bank system, when your capacitors fail the PFC equipment will no longer be reducing your Power Factor. Without constant maintenance and monitoring you would not even know. Your Power Factor would return to its original level and your power costs would rise. This will result in your energy costs returning to the levels prior to your investment in the PFC equipment. This creates the need for regular inspections, parts replacement and ultimately high maintenance costs. Finding solutions with longevity and best performance (max avail ROI) is paramount. Fuseco’s solutions save space & are easy to install. PFC solutions with solid reliability & great ROI offer opportunities for cost reductions in water management systems. Fuseco offers solutions with industry leading reliability & ROI. Money is saved due to superior performance, less maintenance, no capacitor banks plus more. We inform about the latest reliable PFC solutions, assist with compliance to specifications, space considerations & advise on maximum available ROI.